Supporting the increasing global demand for safe, reliable and sustainable energy production. Providing solutions for innovative medical measurement equipment across the globe. 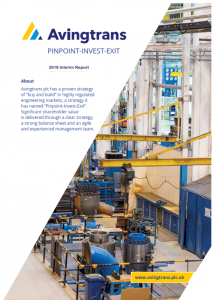 Avingtrans plc has a proven strategy of “buy and build” in highly regulated engineering markets, a strategy it has named “Pinpoint-Invest-Exit”. Significant shareholder value is delivered through a clear strategy, a strong balance sheet and an agile and experienced management team.